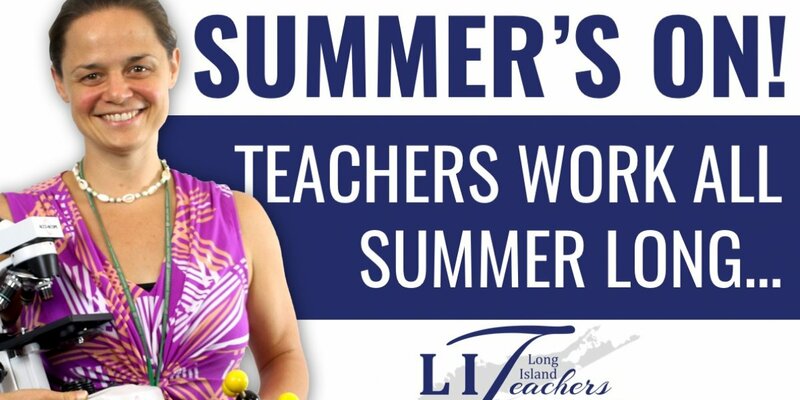 Summer's On - Teachers Work All Summer Long! It’s a common misconception that educators spend all day at the beach, if they do, they are the lifeguards. Teachers run summer camps, teach extended coursework and coordinate enrichment programs in reading, science, and math. Teachers unions secure funding for school supplies and get books in the hands of their students. Have a Happy Summer Everyone! My name is Patty Trongone, I teach Physics at Westbury High School. This summer I am Coordinating seven STEAM – Science, Technology, Engineering, Art, and Math enrichment programs for over 100 students in grades two through twelve. Our students are doing experiments on brine shrimp at the Cradle of Aviation. Summertime is Science time for me. LongIslandTeachers.org. Teacher Leaders in the Community. This public e-newsletter is intended to educate our political friends and neighbors, community allies and the press and media as to the important work we do, the charities we care about and the challenges we face. Thank you for your interest in The Long Island Teachers. Over 100 Local Teachers Unions across Long Island, New York. Standing up and fighting for quality Public Education for all.